Fluffy peanut butter filling inside chocolate cakes rolled in crushed peanut butter cups. Triple filling of marshmallow, fluffy salted peanut butter, and chocolate buttercreams inside chocolate cakes. Whoopie doesn't come any bigger! Toasted marshmallow and chocolate fillings inside graham cakes. You will love me even s’more! Coconut cream filling inside graham cakes rolled in toasted coconut. Marshmallow filling inside orange cakes drizzled with white chocolate. A classic taste and no drippy mess! Chocolate buttercream between chocolate cakes rolled in mini chocolate chips. Simply worth dying for! Cream cheese filling between pumpkin cakes rolled in toasted walnuts. Apple pie buttercream inside cinnamon cakes drizzled with caramel glaze. All the taste without the crust! Cotton candy buttercream inside tie-dye swirled vanilla cakes. 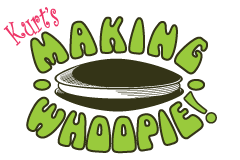 The grooviest whoopie around. Large cakey cookies with vanilla and chocolate buttercreams. You will go “lunar” for them! Mascarpone filling inside light cinnamon cakes rolled in mini chocolate chip dusted with confectioner’s sugar. Tangy lemon buttercream filling between gingerbread cakes dusted with confectioner’s sugar. A holiday treat! Mocha cakes filled with Bailey's Irish Cream buttercream. Perfect after dinner treat. Carrot cakes filled with cream cheese filling rolled in toasted walnuts! Orange/tequila buttercream inside lime cakes with a lightly salted rim. Maple/bacon buttercream between maple cakes topped with maple glaze and crushed bacon. Kahlua/Bailey's buttercream filling inside chocolate cakes drizzled with milk chocolate. Fluffy salted peanut butter filling inside vanilla cakes drizzled with white chocolate. Chocolate cakes filled with crème de menthe buttercream rolled in crushed Andes Candies. Cream cheese filling with red velvet cakes rolled in toasted nuts. Blueberry buttercream inside tangy lemon cakes drizzled with a zingy lemon glaze. Strawberry buttercream between chocolate cakes drizzled with white chocolate. How romantic! Molasses buttercream inside cinnamon cakes rolled in toasted sugary topping. Two Amish treats in one! Fluffy vanilla buttercream filling inside moist chocolate cakes. 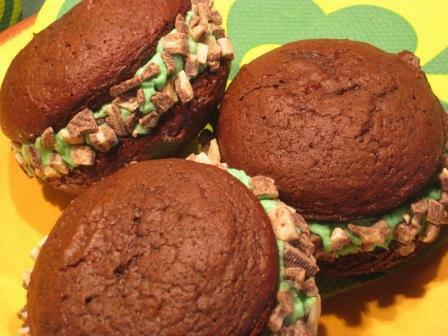 Whoopie like yo’ momma used to make!